SmartFoxServer is a multi-platform application written in Java so, it can run on many different operating systems. Double click on the installer and follow the simple instructions on screen. When the process is finished you will find a new SmartFoxServer folder under the Start > Programs menu where you can launch the server and access the other application folders. From the Windows Start Menu open the SmartFoxServer folder and click on the Install Service icon to install SmartFoxServer as a windows service. Once this is done you will find it listed in the windows services under the management console. 1. Right-click My Computer, and choose Manage. 2. Expand the Services & Applications tab, and select Services. 3. Select SmartFoxServer and use the control buttons or right click on it to access the context menu. In order to uninstall the server as a service just click the Uninstall Service icon from the Start > Programs > SmartFoxServer menu. Installing SmartFoxServer under the C:\Program Files\ path will not allow you to modify the configuration and example files, as Windows requires administrator privileges to modify any file under that path. If you intend to open and edit the example files you will have to move them to a directory under your home folder to avoid problems with write privileges. Our suggestion is to install the whole SmartFoxServer package under your home folder to avoid any of the aforementioned issues. Since version 1.5 SmartFoxServer comes with its own x86 32-bit Sun Java Runtime. 1. open a terminal window and move to the folder where you have downloaded the file. 3. type "tar xf filename.tar" to extract the files. Follow the simple instructions on screen and once you're done you can safely delete the downloaded folder. In order to install SmartFoxServer as a daemon you will need root priviliges. Open the Server/ folder and double click the SmartFoxServer icon. You can also drag and drop the SmartFoxServer PRO icon to the dock in order to keep the application launcher at hand. An output window will appear showing the console output of the Server. You can shut down SmartFoxServer by simply pressing the Cancel button in the output window. The additional requirement is that you have a Sun Java Runtime 5 or higher installed in your OS . Optionally you can safely remove the jre/ folder, as it contains a Linux x-86 specific JRE which you may not use. 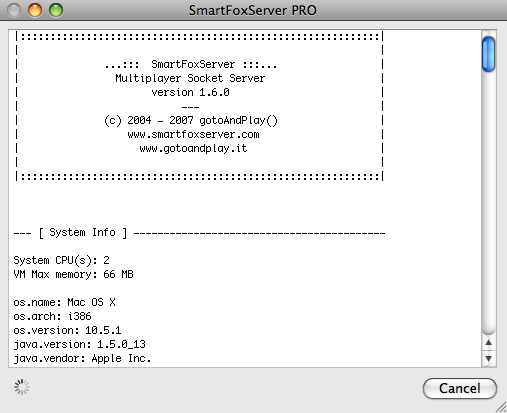 To complete the setup you will need to install the SmartFoxServer API extension for Adobe Flash. The extension will add new objects that you can use in ActionScript to interact with the server. To install the API just open the Flash API/ folder in your SFS main directory and choose the appropriate version. Due to the various bugs and update difficulties found using the Adobe Extension Manager we don't provide the API in mxp format anymore. The Flash/Flex API are now distributed as source files that you can store in your preferred directory on your local disk. In order to add them to your projects you will simply have to point your application classpath to that directory. For more info about the Flash Client API, please refer to section 4.1, and section 4.2 of this documentation. The software comes bundled with the latest 32-bit Sun Java Runtime Edition. If you are running a 64-bit operating system you should download the latest 64-bit version of the JRE from the Sun website and substitute the bundled SmartFoxServer jre/ folder with the new version version. MacOS X users should already have the right JRE version (32/64 bit) installed in the system. SmartFoxServer uses a third-party, open source JRE wrapper called Java Service Wrapper by Tanuki Software, to launch the application as server/daemon for Windows, Linux and MacOS. Each distribution of the server comes with its own 32-bit version of the wrapper. If you are under a 64-bit OS the application will probably refuse to work and you will need replace it with the native 64-bit binary. At the time of writing (October 2008) there exist community versions for Linux(64) and MacOSX(64), while the Windows version is only commercial. You can learn more at the Tanuki Wrapper website.